The Yarra Institute for Religion and Social Policy by formally closed in November 2018 after passing the baton to the University of Divinity’s new Centre for Research in Religion and Social Policy which was launched in late 2016 with Rev. Dr Gordon Preece as Director. An initiative of Social Policy Connections, the Yarra Institute was launched in early 2009 by Professor Brian Howe. It sought to bring a new research capability about the role of the faith and religion in shaping social policy in Australia. Members of various church groups were involved in the direction of the Yarra Institute. The Yarra Institute Board members included known scholars and include Rev Dr Stephen Ames (chair), Dr John Bottomley, Professor Therese D’Orsa, Dr Jim D’Orsa, Dr Anne Elvey, Dr Rowan Ireland, Dr John D’Arcy May, Dr Peter Price, Dr Robyn Reynolds OLSH and Dr Paul Rule. Dr Bruce Duncan CSsR has been Director. The Yarra Institute was located in the graduate Study Centre at the Yarra Theological Union in Box Hill, one of the Colleges constituting the University of Divinity. The new Centre for Research in Religion and Social Policy is located through the University of Divinity, 21 Highbury Grove, Kew, VIC, 3101, +613) 9853 3177 gpreece@divinity.edu.au. The Yarra Institute published a number of books. National Directory of Refugee and Asylum Seeker Support Services of the Australian Churches, compiled by Dr Kirsty Sangster, launched in June 2011, and online. Long-term health costs of mandatory detention of asylum seekers, by Dr Tony Ward (2011), launched by Revd Alastair Macrae, 12 October, 2011. Geoff Lacey, Sufficient for the Day: towards a sustainable culture, launched by Dr Paul Mees, 15 September 2011, at Dymocks, Collins St. Melbourne. Social Justice: Fuller Life in a Fairer World, by Bruce Duncan, Garratt Publishing, 2013. Young People, Faith and Social Justice, by Dr Joan Daw (2012), launched in 17 March 2013 by Dr Kath Engebretson. A World United or a World Exploited? Christian Perspectives on Globalisation (Interface issue), launched by Dr John Henley, 20 June 2013, at YTU. Social Justice and the Churches: Challenges and Responsibilities (2014), launched by Professor Peter Sherlock on 5 November at the Centre for Theology and Ministry in Melbourne. These are the papers presented by representatives from seven Christian traditions at the conference on 8-9 November 2013. Working with Disaster: Clergy and Bushfires, by Lisa Jacobson (April 2015), in collaboration with John Bottomley at Creative Ministries Network. Bonded in Tragedy: United in Hope. The Catholic Church and East Timor’s Struggle for Independence. A Memoir, by Bishop Hilton Deakin with Dr Jim D’Orsa and Professor Therese D’Orsa (Garratt Publishing, 2017). ‘Ecological Aspects of War: Engaging with Biblical Texts’, Anne Elvey (ed. ), accepted by Bloomsbury UK. Bridging Troubled Waters: Australia and Asylum Seekers, by Tony Ward (Melbourne: Australian Scholarly Publication, 2017). An Enabling Life: Father Kevin Mogg: A Collection of Reminiscences (Melbourne: Yarra Institute Press, 2018). A final project on the Morality of Torture, by Dr Cal Ledsham and Dr Brian Johnstone CSsR is not yet completed. 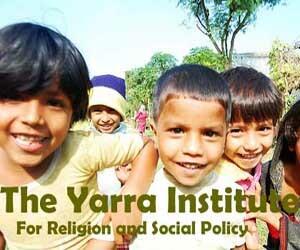 Visit the Yarra Institute for Religion and Social Policy’s website.